Hi everyone! 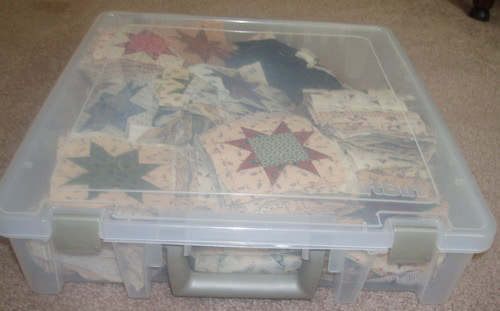 Michele here with some project storage tips from a few quilting friends around the world. Before I get to those, I just want to remind you to share your Before photos on Tuesday’s post: A Space of your Own. We have two copies of Organizing Solutions for Every Quilter: An Illustrated Guide to the Space of Your Dreams to give away. 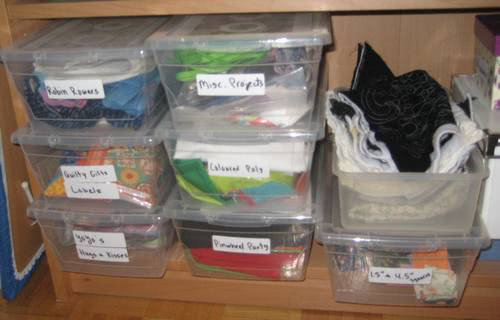 Our first tip is from Pat Sloan and is a continuation of her Studio Organization 101 series. Sometimes we start projects and then … well… we don’t finish them. I know… hard to believe… but it happens to the best of us! Sometimes we need to take a long hard look at that group of “stored” projects. Why? and they often make us feel guilty for putting them aside, they whisper to us in the middle of the night.. finish me.. finish me! How long has it been since you looked at ALL of your stored projects. Really? That long? This is the month to do it.. yes.. haul them all out into the light of day and see what you have. Once again prioritise… most loved, sort of love, long forgot I had it.. and why in the world did I ever decide to make that one? keep the first 2 groups. unpack the last 2 groups. Take the “no longer loved” projects and give them away or sell them. You may want to keep the fabrics and just release the made part. Also consider piecing these unfinished projects into your next quilt back… really.. why not! I like to store my UFOs or fabric collections in plastic bins or pizza boxes. I put all fabric, patterns and blocks into the same box, so that I don’t accidentally use the fabric for something else. These boxes sit on top of a large cabinet and store the fabric collected for upcoming projects. Milo has outgrown his large teddy bear, so that’s hiding up there in the boxes too. 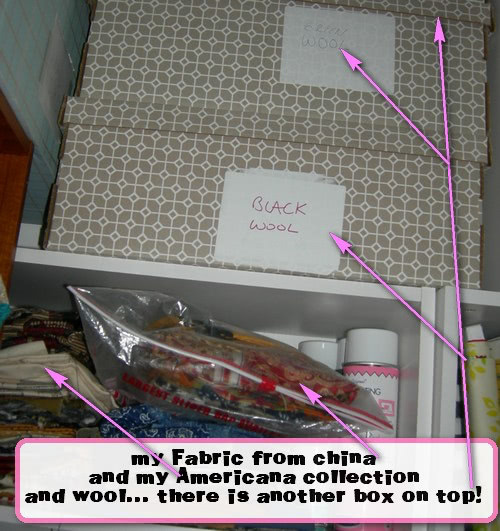 In the sewing room, I have smaller boxes for various projects and pre-cut scraps. These two plastic storage units fit nicely under my work table. Some contain scraps that need to be cut up into various usable sizes and others contain UFOs. These bins need to be re-organized and labelled! I also have a couple of pizza boxes for storing blocks. They are the perfect size for 12.5″ unfinished blocks. Here’s Milo guarding my postage stamp quilt blocks. 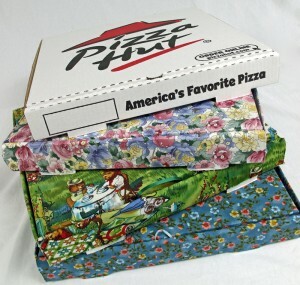 You’ll notice that my pizza box is not nearly as pretty as these ones that Serena Smith covered in fabric. 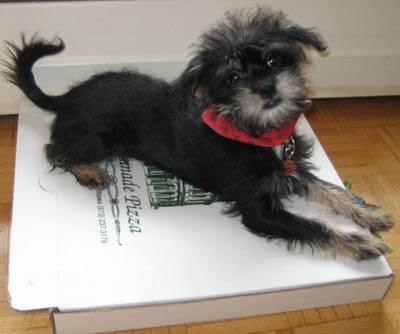 She’s put together two fabulous videos on how to cover a pizza box with fabric. 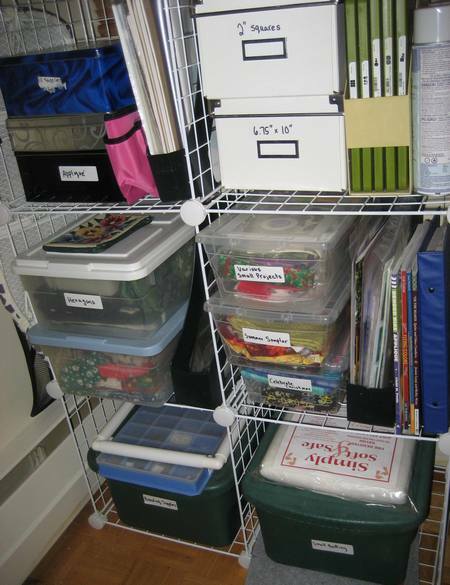 Pam in KC sent me the following photos and tips of her project storage. Wow, isn’t her system impressive! My project storage is probably not unique. I LOVE, LOVE, LOVE the ArtBin Super Satchel Series 9000AB boxes designed for scrap booking. I’ve put one or more sets of blocks in each box and have labeled it so I know what is in the box. I have space for two more boxes and contemplated getting them, but ultimately decided against it to discourage me from starting something new! I tend to start projects and then get waylaid. 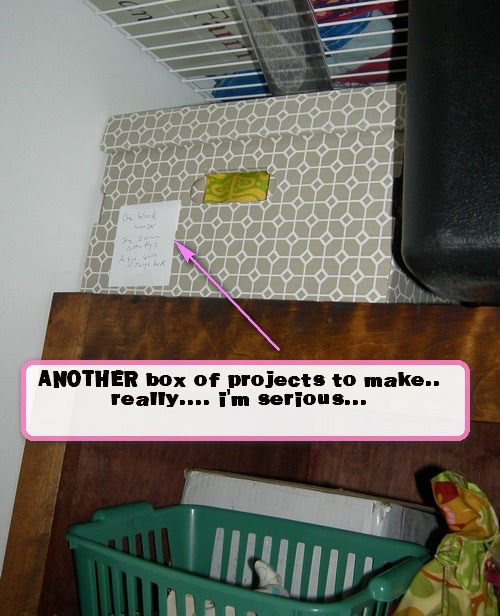 Actually, two of the boxes on my shelf are empty and I need to move a couple of projects out of my secondary storage. The secondary storage is a big plastic bin with bags of projects just tossed in it. I also love 2 & 2 ½ gallon zip top bags. 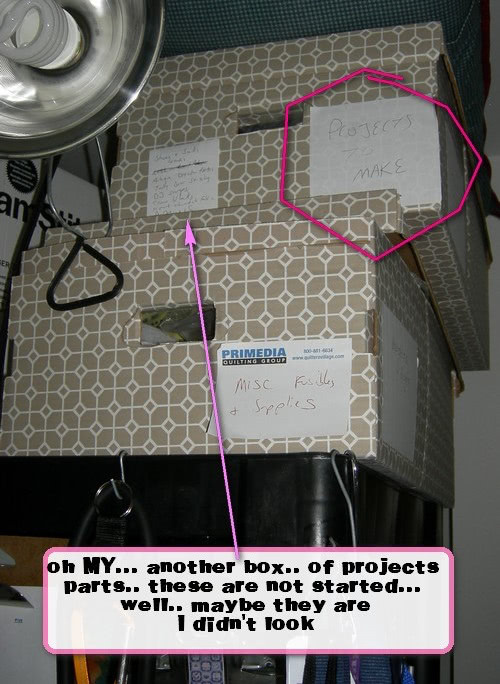 On the outside of the box, I’ve got labels telling me which projects are in the box. Finally, I have two large bins with folded tops. The box on the top of the shelf contains tops and the slightly smaller box on the floor under the shelving unit contains tops with backing. I have a problem turning my tops into quilts as well. But in my defence, I am diligently working on completing these quilts. Here’s a picture of the entire storage system. I probably should have cleaned up a bit. Here’s a tour: Top of left shelf the ufo project boxes. 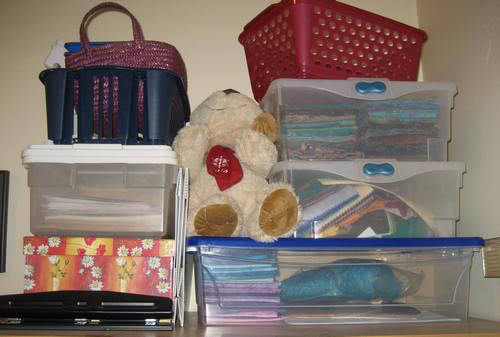 The next three shelves contains fabric, typically less than a yard sorted by color or theme. The frog quilt is held up by magnets. The bottom two shelves contain my yardage. Not pictured, but tucked under the bottom shelf is my extra sewing machine, the case to my main machine and a large box of small batting scraps. 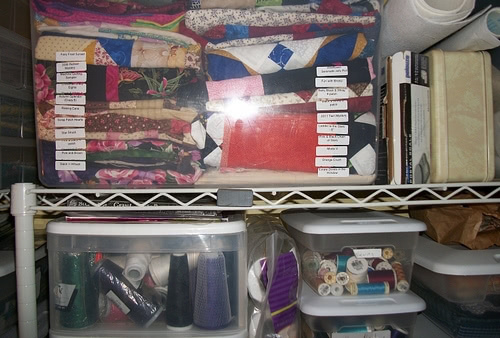 The shelving unit on the right starts with the box of quilt tops with out backing fabric and the box of large batting scraps. The next shelf is for thread and stabilizers. The boxes contain my baby fabric and shirting. 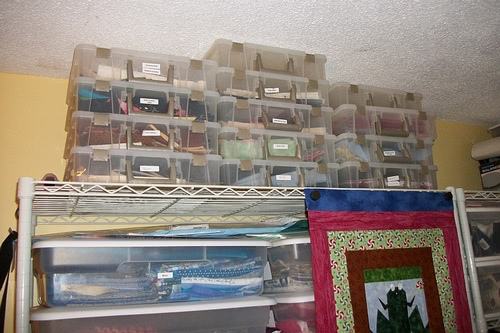 Down one shelf is the start of my scrap saver system – boxes of 1 ½” strips, strings, 2 ½” strips, orphan blocks and the additional UFOs. The shoe boxes on the next shelf contain more pre-cut strips, bricks, and blocks, my vintage fabric and the Christmas fabric. Finally the bottom shelf contains my quilting magazines and patterns. Under this shelf is the box of quilt tops with backing fabric and my serger. 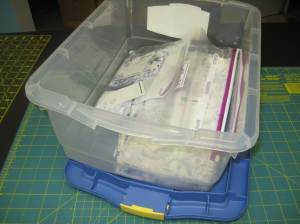 I use the 13″ x 14″ scrapbook paper storage totes to keep all of my quilt projects organized. I buy the clear ones so I can see what is in them. They stack nicely and I can label the end so even if they are on a shelf I know what is in each box. They also have a handle so it’s easy to carry them when going to a quilting bee or retreat. They are large enough to hold a 12″ block (or larger) plus extra fabric, pattern, thread, etc. They also usually come with large flat dividers so I can keep each block separated. This works really well for applique projects. I hang sets of blocks from a closet rod using skirt or pant hangars. Pop up mesh laundry hampers are perfect for storing batting. They’re the right height for packaged rolls, and hold all the smaller pieces, too. I display quilts over the tops of doors that are rarely closed. To keep all the parts of a project or UFO together, I ordered 100 translucent large sturdy plastic bags with handles (like the kind you might be given when buying clothing) from an online packaging supplier. I can write on the outside of the bag with a Sharpie the name of the project and the date started. I can see through it to view the contents, and they stack on a shelf. I’ve got about 30 projects bagged up and easy to grab. For a project that is going to take a long time I like to keep everything together. I started a mystery quilt last September that was supposed to take about 6 months. I’m keeping it organized. 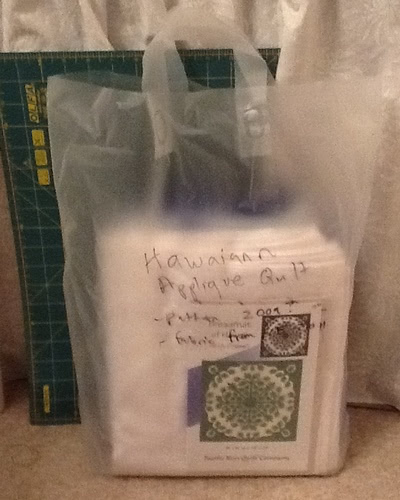 I did all the cutting and labelled the pieces with sticky notes, popped them in baggies, and loaded all including scraps and extra fabric into a storage box. I like clear plastic boxes so I can tell what’s inside when there are a few of them around. As I get the new instructions each month (I keep them all together in the box too), I re-label the sewn units. Then I won’t get confused next month. I have another project in the collection stage and I’ve started a box for it: so far it has a book, a template, a new specialty rotary cutter, and fabrics of course. 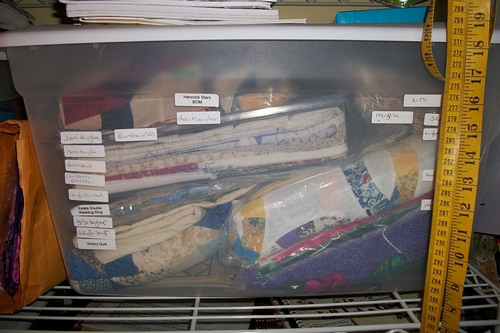 Thanks to today’s guests for sharing their tips and ideas on how they store their quilting projects. What about you? What project storage ideas or tips do you have? Please share in the comments. 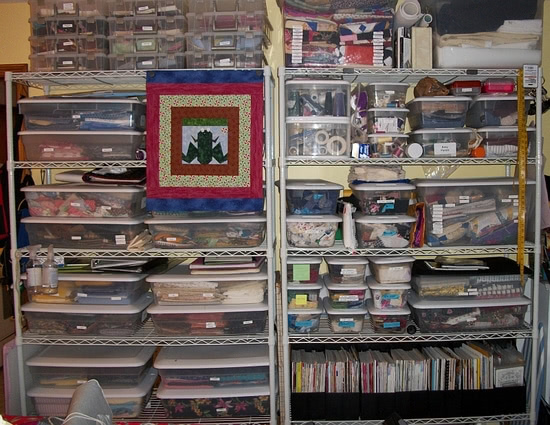 Don’t forget to share your Before photos on Tuesday’s post A Space of your Own for a chance to win Organizing Solutions for Every Quilter: An Illustrated Guide to the Space of Your Dreams. Thank you so much for all the wonderful storage ideas and tips. I need all the help I can get. 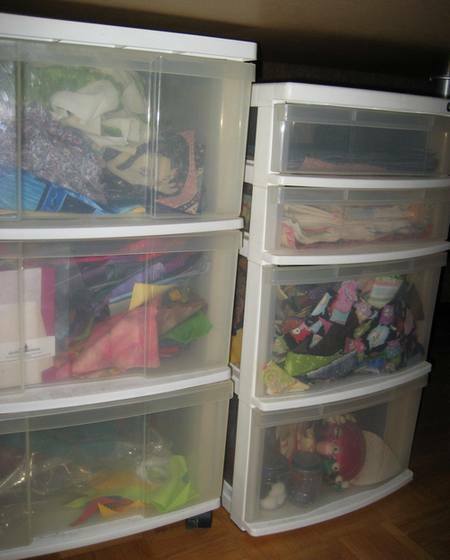 I just purchace plastic bins (the side to store shoes) from Home Depot and I plan to get all my scraps, projects, thread, etc stored so I can find things. Wow, I really learned some great ideas that I can use in my own room. Thanks everyone. I hang my finished tops with the backing and binding fabrics, if I have it already on pants hangers in my closet. I can quickly see what I have there and what I need to finish it. It usually takes 2 hangers if you have everything you need for it so I put a rubberband around them to keep them together. Great information. Always need ideas on organizing. Well, lemme tell you, when we lived in our RV, space was surely at a premium. 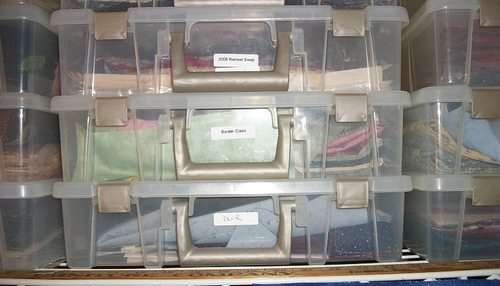 I had boxes & totes of fabric stored in the obvious places (drawers & closets & underneath, outside) of course, but my embroidery threads were stored in those Slimline Sulky boxes and then hid away under the sofa! And my huge cutting mat (that was larger than my table) was stored between the sofa and the wall, on its edge. There was just enough room that it wouldn’t sag or warp. Now that we’re living in a real house again, I was lucky enough to score a small wooden desk with drawers for my serger. I keep the serger thread in a couple of clear boxes (about shoe box size) stored in the drawers of the desk. I mostly go back & forth between cream and black thread, so I keep the unused set of 5 cones in a (cleaned) tray that once held a few pounds of hamburger meat. There is just enough room behind the serger (and under the thread stand) to keep this tray – it’s always right at my fingertips and I can immediately see if I need to replace any thread! IKEA has many items that work really well for storage. For instance, I have two of their CD towers flanking my “Billy” bookcase, and they are ideal for stacking fat quarters while keeping them readily visible. I also like their cardboard boxes and magazine holders, which reduce the “visual” clutter by providing a uniform display. Note: a label maker is essential at keeping things looking neat – and being able to find things again!